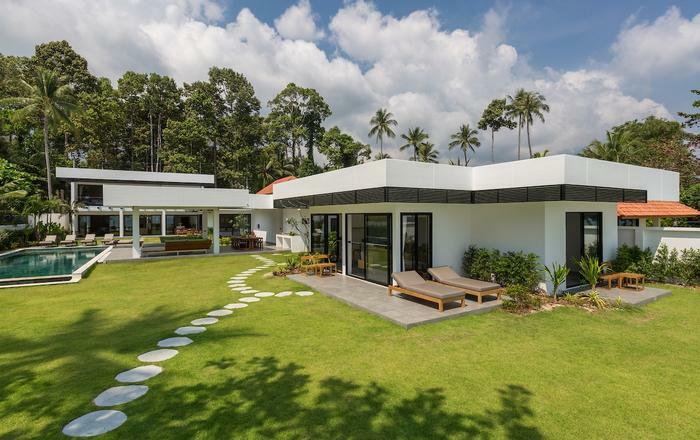 Situated on the highest point of the exclusive Headland Estate, this 2-bedroom Koh Samui villa (sleeps 4) overlooks a luscious valley that tumbles towards the shimmering waters of the Andaman Sea. Brimming with contemporary style, this chic retreat boasts a private lap pool, gorgeous outdoor lounge areas, and a tucked-away mezzanine TV lounge. A living pavilion and sumptuous bedrooms all boast fold-away glass doors to let the warm sea breeze drift indoors. 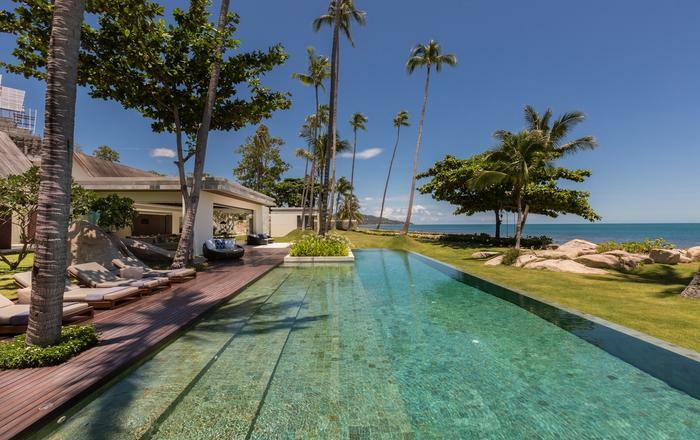 Soak up Samui's tropical weather around your inviting lap pool, set at the heart of this ocean-facing villa. After a dip in the water, grab your shades and flop down on a garden sun lounger overlooking the ocean. In the midday sun, the poolside lounge offers a cool hangout to doze in the shade, or plan the evening's entertainment. Later, flip-flop inside the spacious living, dining, and kitchen pavilion. The interior space is designer-magazine chic, with white vaulted ceilings and custom decor. Enjoy your favourite holiday novel while sprawling on the plush L-shaped couch. Opposite, a large blonde wood dining table offers space for family chats and lazy lunches. And just behind, a fully equipped kitchen is perfectly placed to mix impromptu afternoon cocktails! Need a moment to yourself? Settle back for a movie (or stretch out for a nap) in a mezzanine TV room with a convenient sleeper sofa. In the evenings, pick a chilled bottle from the in-villa wine selection. 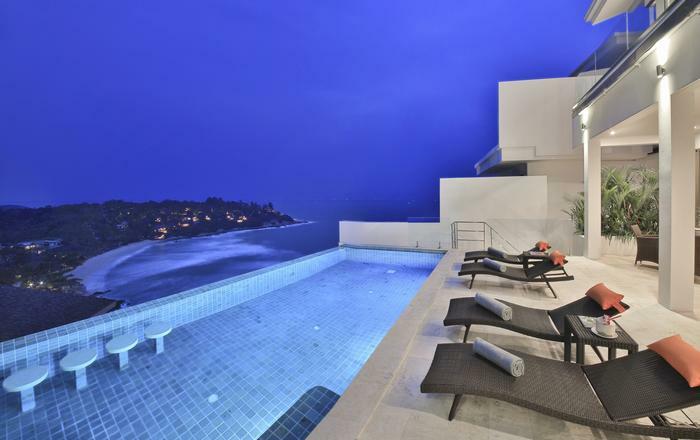 Then share drinks by candlelight on the rooftop lounge as the stars appear overhead. Both bedrooms boast private en-suite bathrooms, open to the pool, and fold-away glass walls that let you drift off to the sound of the ocean. The first bedroom has a pair of twin beds, and the second guest bedroom features a four-poster king bed with flowing white drapes. 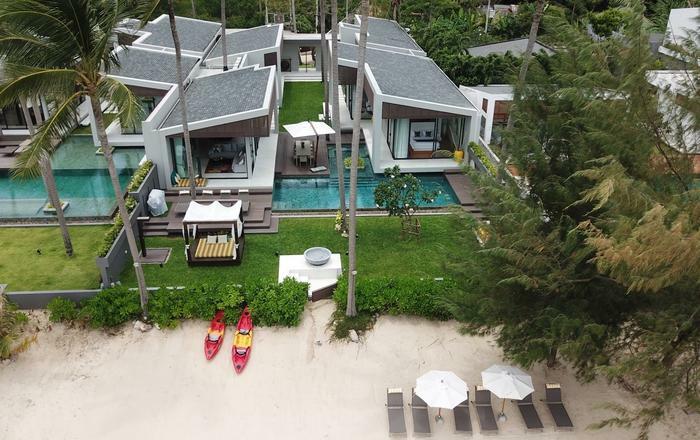 The villa occupies an unspoiled natural setting on a quiet cliffside, located just north of the quaint seaside village of Baan Taling Ngam. 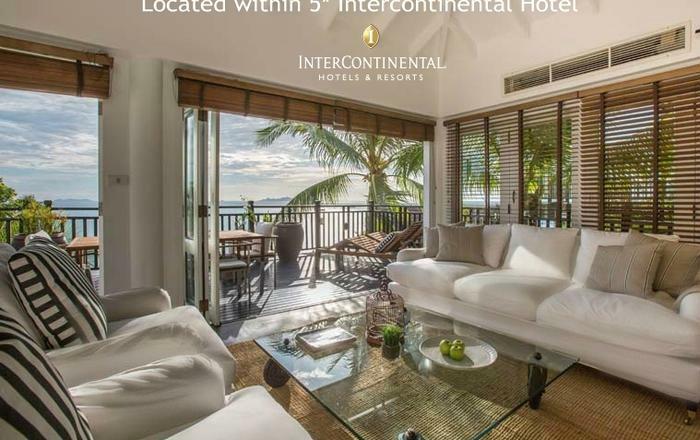 From this secluded setting, it's just a 20-minute drive to the resort area of Lamai Beach, which offers an abundance of restaurants, bars, and buzzing nightlife. Save time to wander around the town of Nathon (a 15-minute drive away) for shopping, cafes, and crowd-pleasing eateries. 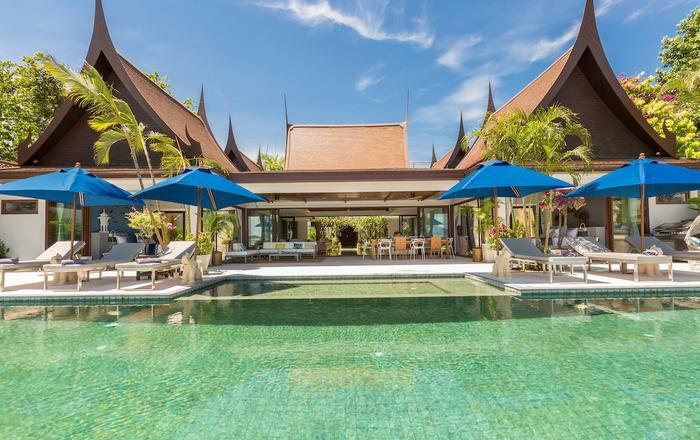 The villa also sits adjacent to the Samui Intercontinental resort, which boasts its own beachfront restaurant, a spa, and opportunities for fun-filled watersports activities. One airport transfer each way, live-in staff, a daily breakfast, concierge service and English speaking villa manager. If it becomes necessary to cancel all or any part of the booking, Luxury Asia Lifestyles must be notified in writing (email acceptable). The cancellation will take effect from the day the written confirmation is received.